Backreaction: What is the viscosity of space-time? One of the most general expectations of quantum gravity is that space-time is not the smooth background of General Relativity, but instead a wildly fluctuating, bubbly, foamy mess. Seeing the quantum properties of space-time directly is not presently possible, but what we can see is whether the quantum gravitational behavior affects the way particles travel through space-time. One way this could happen is by distorting paths so that photons of different frequency (energy) move at slightly different speeds. Such an effect is referred to as ‘dispersion’. Next to dispersion there is dissipation, which is basically energy loss into the background. While quantum gravitationally induced dispersion has received substantial attention during the last decade, dissipation hasn’t received as much love. They start with a general hydrodynamic ansatz that assigns space-time the properties of a fluid, notably a viscosity, which causes dissipation. The microscopic theory that would give rise to such a hydrodynamic behavior they leave unspecified and just ask what observable consequences a non-vanishing space-time viscosity would have. With this ansatz, they make an expansion of the dispersion relation and collect the dissipative (imaginary) contributions. 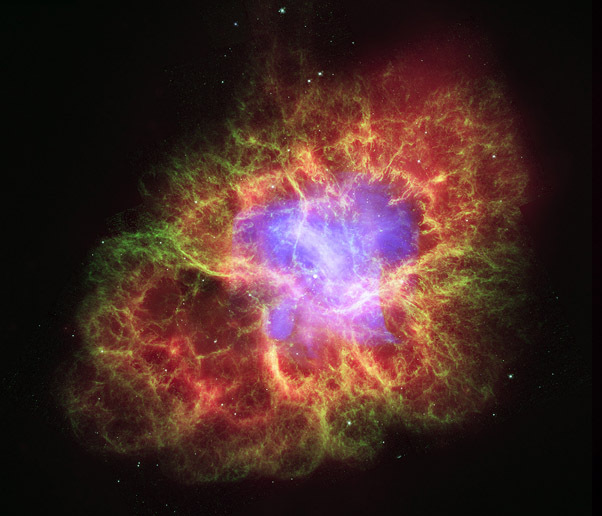 Then they look at observations of highly energetic photons from a distant source, the Crab nebula. If space-time was viscous, the photons would lose energy during their travel. Already the rather conservative estimate that the photons of the highest observed energies shouldn’t have lost more energy than they have left at arrival leads to very tight constraints. If the photons lose energy faster than that, the spectrum we receive on Earth would be highly distorted and pretty much incompatible with our knowledge of astrophysics. This constraint from existing data clearly rules out Planck scale effects, ie effects that plausibly have a quantum gravitational origin, at first order. Better constraints can be obtained by drawing upon concrete astrophysical models for the typical energy of photons that are emitted, so it seems likely that in the future we will see even better constraints on this. Much like with violations of Lorentz-invariance this is a case where nothing has been found. Yeah, Einstein was right, again. But this doesn’t mean that nothing has been learned. We’ve learned that any model for an emergent space-time that does not have a very small, almost vanishing, viscosity is clearly incompatible with observation. Yes, Hyperphysics has been a companion resource for a long time. Under a specific title one would have to see how to apply that language in the context of what you are saying. Here you are applying in a very large sense and with regard to a spherical cow, how would you write such a collapse to get too? High energy particle dispersions on the scale of what is transmitted out into space? They arrive here on earth, is repeated on a "microscopic level," or, how would such backdrops reveal any particulate dispersions for display? Very dissipative energy , to be encourage to display. On a large scale what would space-time look like? Imagine, the photons, as encouraging a type of lensing, as Lagrangian? Massless boson photons are inert to dissipation, fermionic matter is not inert. Rigorously derived Euclid fails. General relativity (GR) postulates the Equivalence Principle (EP). All material bodies locally vacuum free fall along identical minimum action trajectories, validated to 14+ significant figures: Eötvös experiments, Nordtvedt effect, stellar binaries PSR J1903+0327 and PSR J0348+0432. GR fails given Einstein-Cartan-Kibble-Sciama gravitation. If EP = true, then GR and racemic spacetime curvature . If EP = false, then chiral spacetime torsion. ECKS space has differential viscosity toward non-superposable mirror image mass distributions (chirality inverts one spatial axis, parity inverts all three). Absolutely discontinuous symmetry parity is outside Noether's theorems. Geometric parity is observed (no S_n axes ) and calculated but cannot be measured. Massless boson photons do not display vacuum refraction, dispersion, dissipation, dichroism, or gyrotropy. Helical light does not naturally occur. Chemically and visually identical (e.g., solid balls) single crystals in enantiomorphic space groups violate the EP. Chern-Simons parity repair of Einstein-Hilbert action is sourced. Dark matter curve fitting the Tully-Fisher relation is a Noetherian vacuum isotropy coupled to angular momentum conservation leak for matter as MOND's Milgrom acceleration. Geometric Eötvös experiments contrast single crystal test masses of space groups P3(1)21 versus P3(2)21 alpha-quartz or P3(1) versus P3(2) gamma-glycine. No axiomatic system can falsify itself. Observe the external falsification. The Earth's orbit does not dissipate despite chiral minerals and homochiral biology. Minerals are racemic (within statistical error of counting quartz sand grains). Left-handed chiral protein amino acids (meat) are cancelled by right-handed chiral sugars (cellulose, starch, vegetable gums). The paper appears to limit a modern QG version of Zwicky's "Tired Light" mechanism (http://en.wikipedia.org/wiki/Tired_light). Sabine, I think you are spinning your wheels concentrating on photons for these small violations instead of fermions. "Spinning your wheels" is an appropriate metaphor too. Photons have circular polarization,i.e., they have intrinsic helicity, with spin plane perpendicular to velocity. They literally ALWAYS are spinning their wheels. If they didn't, and had their spin polarization parallel with any acceleration force, then a photon would experience faster than light speed velocity in portions of the spin orbit. This would have to be true for the total velocity around the orbit to equal c.
On the other hand, a fermion with up or down polarization will bend into the vacuum "wind" during acceleration. They change angular momentum and kinetic energy during acceleration. That's why a free particle that is a charged fermion don't have linear geodesics, even in the absense of a gravitational field. But you put that same fermion in a composite bundle of fermions that has neutral charge then it will a linear path in space, even when accelerated. Where does that change in angular momentum for each individual fermion go? Well, it changes kinetic angular momentum while its held within the composite particle. That angular velocity from separateness to compositeness moves from visible change in angular velocity in space to invisible change in angular momentum for each individual fermion held within the overall neutral particle. I should add that the violations you should be looking for is DEFICITS in measured kinetic energy of fermions after acceleration. If you can get a fermion to act more like a boson then you've got something interesting you can work with! In such models there is always a residual continuity even if very small from one view... This is a sort of gravitational lens on a higher level of symmetry. It was this photo that got me thinking beyond say a level of (not quite workable string theory) the universe itself is rather like a giant supercollider to which when we look ever finer the higher effects we imagine as dark phenomena or substance is fairly obvious, and perhaps this a way to measure... All such geometries including Euclidean stand or fall together, logically. Groan. Sabine, this is horrible. This is cargo-cult. Spacetime is not some background, it's an abstract mathematical space in which there is no motion at all. Nothing travels through spacetime because it's an all-times model. Things travel through space. And whilst space has its vacuum fluctuations, these are like mere ripplets on the surface of the ocean, they are but nothing compared to its depth or density. And no, photons with different frequencies do NOT travel at different speeds, just as heavy masses don't fall faster than lighter masses. Nor does light get tired. And by the way, space isn't viscous, it's elastic. Perfectly so. Why is it that people who put up papers about quantum gravity don't have a clue about general relativity? Get used to it. When all the isolated natives on the island have the same tools and the same proclivities (good math ability only) then all physics problems become abstract mathematical nails that they can use their hammer on. But you have to watch out. They can be a volatile bunch. There is always that huge container of boiling water that they like to throw the most annoying invaders into. LOL, all points noted Eric. Good job I'm flying over the island at 32000ft. Piloting the Enola Gay! Does this hydrodynamics Ansatz, that leads to the viscosity of spacetime also allow for some kind of "space time turbulence"? I often like articles on this blog, but the comment sections more often than not annoy me such that I mostly skip them. If spacetime is viscous in this sense, you are looking at the analog of photon-phonon scattering (Brillouin scattering). Shouldn't it be possible to calculate what the phonon analogs look like? Are they just ordinary gravitational waves? Nemo: of course, some might say that the person doing the downvoting is the very blogger himself. Aw, self-promotion can get real ugly real quick. Before you know it you're into pimping propaganda and sensational censorship. Thankfully for all concerned, Sabine doesn't go in for all that. She's a conscientious rational scientist who seeks to advance human knowledge rather than herself. Salt of the earth and all that. Oh, and by the way: if you've got nothing to say about physics, don't bother saying it. "So don't say I never warned you. " At least one native is already upset. It doesn't take much to fire up the kettle in today's physics community. One would think that, given the amazing empirical success of General Relativity, no sensible person would be motivated to replace it with a plastic "emergent" imitation. Why do we look askance at the best foundation physics has ever had? I would suggest that the answer to this question is deeply entangled with our addiction to strict reductionism. There are other approaches to understanding nature that retain the best physics (like GR, EM, QM), and jettison the most empirically unmotivated assumptions. Alas, they are not currently fashionable. "Why is it that people who put up papers about quantum gravity don't have a clue about general relativity?" You're close to reaching the limits of my patience. We have previously noticed that you a) know next to nothing about physics but b) believe you understand everything and c) can do everything better than d) people who for mysterious reasons publish scientific articles on questions you have all the answers to. And to top it all off you e) constantly insult me and my colleagues with entirely unsubstantial criticism and proclamations of your own ingenuity. Not so surprisingly, I see you get along well with Zephir. Why don't you two guys hang out somewhere else and explain your so-called theories to each other. Thanks so such for the update and explanation. I'm wondering who would have thought that from a QM point of view it would be SR and QM which so far proves to be the most stubbornly persistent illusions. This is simply not true at the water surface, so it cannot be true even in dense aether model. In AWT the Russel's solitons play a role of photons in vacuum, so we should focus to soliton behaviour. If we send a soliton along water surface, this soliton contains a mixture of waves of various wavelengths, described with spectral Green function of energetic impulse. But these waves don't separate by their wavelengths, just because they're spreading in soliton. The short wavelength waves don't separate itself from it and don't recede the motion of soliton, the long wavelenghts don't separate itself from soliton and don't advance it. Such a soliton still exhibits the apparent scattering, i.e. its amplitude diminishes with time, its spectral density decreases as it blurs inside of background - but it still remains a coherent soliton. The conclusion is: use less math mechanically and use more your head instead. BTW The dispersion and scattering has nothing with viscosity, as it occurs even inside of superfluids. It's simple consequence of the fact, that the wave of shorter wavelength increases the specific surface area of fluid surface more, than the long wavelength ripple. Larger surface area exposes more density fluctuations (i.e. the Brownian noise at the fluid surface, the Higgs field and CMBR noise inside of vacuum), so it slows down more the propagation of another ripples, which are spreading through undulating place. This is the geometrical basis of mass/energy equivalence in dense aether model, because the slowing of energy spreading (dilatation of time arrow) is generally attributed to inertia and gravitational lensing of objects . The blurring of photons with distance is generally connected with so-called red shift phenomena and with blurring of distant images of galaxies, which appear relatively larger that these nearby ones just because of it. It enables to falsify the Big Bang cosmology easily because this cosmology is based on omnidirectional space-expansion and the distant (i.e. "older") galaxies should appear smaller in it instead. Sabine: I'm not misinformed. I understand general relativity. If you'd like to address any of the points I raised on this or your previous blog entry I'd be only too happy to talk further. Analogue opportunities help to define circumstance given within the Crab Nebula and of course we appreciate where the cutoff exists here in the real world. :) So one definitely looks for opportunities, Cosmologically in regards to in the geometric? Mathematically, in some model. "Analogies have played a very important role in physics and mathematics - they provide new ways of looking at problems that permit cross-fertilization of ideas among different branches of science. A carefully chosen analogy can be extremely useful in focusing attention on a specific problem, and in suggesting unexpected routes to a possible solution. In this review article we will focus on “analogue gravity”, the development of analogies (typically but not always based on condensed matter physics) to probe aspects of the physics of curved spacetime - and in particular to probe aspects of curved space quantum field theory. IMHO you'd be better off looking at Ned Wright's deflection and Delay of Light Plato. Note the sentence that says this: "In a very real sense, the delay experienced by light passing a massive object is responsible for the deflection of the light". Einstein said much the same in Relativity: the Special and General Theory. This was the 1920 translation of the book he wrote in German in 1916. In the original he said a curvature of the rays of light can only occur when die Ausbreitungs-geschwindigkeit des Lichtes mit dem Orte variiert. That's when the propagation speed of light with the location varies. Or the speed of light varies with position. Sabine is German. I'm sure she will confirm this for you. Also see the first paragraph of the GR section of this Baez article. Best ignore the last sentence in that section, because it contradicts the first paragraph, and so contradicts Einstein. Bee, if we continue to get negative results for presumptive implications of "quantum foam" etc (also rem. the lack of scattering of super high-energy photons by the "granulation" that QF would provide as a sort of translucency), then what implications does that have? It seemed intuitively necessary to many people that space-time be granulated etc at this fine scale and I suppose we're left somewhat adrift if it's not found. The nondispersive but dissipative environments are quite common in the nature. Before some time I pointed out, that the Apollonian dark band between primary and secondary rainbows behaves in the same way, like the vacuum in wide range of wavelength: it apparently scatters some energy (as it appears darker), but it doesn't generate rainbow during it - i.e. it's not dispersive. The metamaterials are such an environments too, which is why they're studied as a models of vacuum for demonstration of various refractive phenomena around black holes. The absence of dispersion doesn't imply the universal validity of Lorentz symmetry or homogeneity of space-time. For example the soap foam itself isn't homogeneous environment - yet it isn't dispersive, as its density increases during shaking, so it has a tendency to propagate the waves like the nondispersive solitons. Water surface or surface of metals behaves in the same way in certain range of conditions. Thanks for the references you provided here. I think analogues are in general a good approach to guide one's intuition, even if they aren't usually "perfect" models. I hadn't known about the Living Reviews web site. It looks interesting and informative. I wish more physicists would use this approach to improve their physics intuition, while refraining from taking them too literally. That's where people seem to run afoul. Amateur physicist take them too literally, while professional physicists often refuse to use analogues at all simply because they can't usually be taken literally.
" just as heavy masses don't fall faster than lighter masses"
Even I can see you do not have a deep grasp of relativity. And Eric, I would bet money you did not understand anything of Uncle Al's comment. and if any analogy is said to be true it is those in geometry. The inquiry theme of this paper asks deeper questions than you amateurs evidently understand taking things like viscosity and plasticity way too literally to say apply it to Higgs fields and acceleration. "And Eric, I would bet money you did not understand anything of Uncle Al's comment. and if any analogy is said to be true it is those in geometry." You're right in that I didn't understand everything that Uncle Al said. Did you? Be honest. I did understand what he said about photon helicity, and disagree. If you picture helicity like double strands of DNA, then no, photon helicity doesn't occur naturally. But its not like that. It maintains a spin plane orthagonal to acceleration of any type, for instance gravity. This is distinctly different from fermions. Fermions have helicity in the classical sense like DNA strands because of the cross product rule. You misunderstood what I was saying and then, as is typical, arrogantly decided that I did not know what I was talking about. Photons DO have helicity in the sense that the center of mass is always in the center of the column and the abstract spin energy represents the energy creating the helicity in the space geometry. This kind of helicity is different from the kind where the center of mass moves in a helical fashion. Again the problem of people being to literal minded and requiring certain coded handshakes to pass muster and knowing what they are talking about. A bit of humility might be in order. "With regard to Robert post. Our model of dissipation and the tired light are different in two ways. An obvious one is that in our case this emergent spacetime induced effect could be there in principle for any particle not just for photons. The second, and more important point, is that the energy dissipation is in our case an energy dependent effect (mainly effective only for very high energy particles) which as such would give a very different signature w.r.t. tired light." You seem to have a hard time understanding what I'm saying, and are evidently unable to parse our comment rules, so I'll repeat it one last time. Please do not discuss in this blog's comment sections your interpretation of gravity or your reading of Einstein, or any other subject irrelevant to the topic of my posts. Just as a reminder, in this case it is the recent paper by Stefano and Luca. If you have questions about general relativity (or insist on 'educating' others about it), please do so elsewhere. It was referenced in the article Bee put up. An Analogue Gravity lead. The framework of Analogue gravity , has been widely used as a test field for the phenomenology of quantum field theory on a curved space-time. These kinds of analogue methods have been implored for some time now. Space viscous toward photons violates prior observation. Acting upon matter is Equivalence Principle violation, but postulates cannot be defended. GR chokes on fermions and black holes; plus Chern-Simons parity artifacts of Einstein-Hilbert action in quantum gravitation. The standard model suffers parity violations, chiral anomalies, symmetry breakings. SUSY is empirically wrong. Euclid is rigorous, one of eight primary 3-space geometries. Euclid versus cartography, E^3 versus S^3, fails at the postulate level. Physical theory is rigorous. Parameterizations afford no suppression of new anomalies to be curve-fit in kind. Cartography says "no parameterization exactly flattens the Earth." Boson photon vacuum symmetries are not exactly true for fermionic matter. My geometric test of spacetime geometry exists in hardware. It tests an alternate postulate, validated or falsified within 90 days. 17,000 days of empirically failed rigorous theory is "Empress Eugenie's circle" on a parade ground - a robust suspension bridge with no end connects. Do the test. Sabine, re: "Please do not discuss in this blog's comment sections your interpretation of gravity or your reading of Einstein". I was trying to help. But nevertheless, I will refrain from quoting what Einstein said, and indeed from commenting here further.